What Do You Do if Your Client is Having an Outburst? Looking back now I see how I could have handled the situation to keep it from escalating to the point that it did but I didn’t know then what I know now. I joined a caregiver group for those taking care of loved ones with mental illness. A great technique the counselor shared with us is called Validation and Redirection. It’s where you try to validate something they are upset about, even if it’s small and then redirect their attention to something else that interests them. What is Validation? In many instances there is something correct in what your client is complaining about. It may be a minor point but agreeing with her about at least one thing can help turn the tide. An example of this happened a few days ago. I was having breakfast with my mother and my granddaughter, who is still a toddler. My granddaughter was hungry and began crying very loudly as toddlers are prone to do. My mother was angry and spouted off. While I couldn’t validate what she said or how she said it I could validate the reason she was upset, a screaming baby is not something anyone enjoys. Just by saying to her I understood why she was upset and empathized that it was not a fun situation for any of us, she started calming down and then our food arrived redirecting her attention. What is Redirection? You might call it changing the subject but it’s a little more than that. The subject has to be one of interest to the dementia patient. While the redirection in the above incident was our food arriving another story would show it better. We were at her doctor’s office. The medical assistant was asking me questions about her medications. No one likes to be talked about when they are sitting right there and she got upset and angry. The medical assistant quickly said, “I’m testing her. I need to see if she can pass the test.” My mother laughed and let it go. 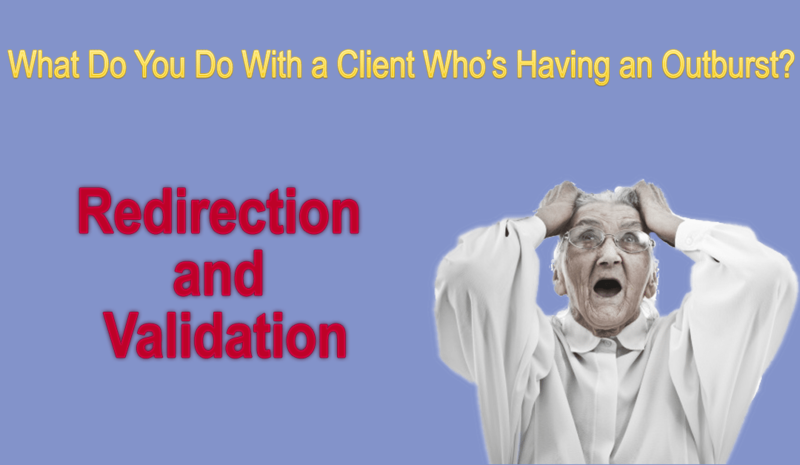 When You Can’t Validate: There will be times when there is nothing that can be validated in a client’s commentary. It’s happened several times and on the advice of the counselor who facilitates my caregiver support group, I simply give her a mild, calm reprimand and then change the subject to something that I know interests her. It takes practice to get this down and let’s be honest, sometimes it’s not going to work. Words will come out of our mouths without thought and make it harder to validate and redirect. When it happens, don’t be hard on yourself, acknowledge what went wrong and think of ways you can help it go better next time with validation and redirection. Caregiving is a difficult and draining job and when caring for a loved one it can be even more difficult. I recommend finding a caregiver support group, I’ve learned a lot fog ret coping skills as well as ways of working with my mother to make the situation a lot easier for the both of us.